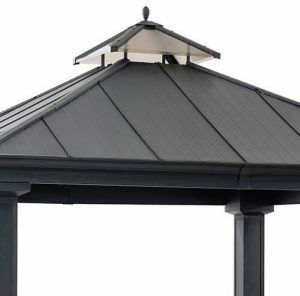 Today, we review the top 5 hard and soft top gazebos by well-known manufacturer Sunjoy. Sunjoy gazebos have both design and functional purposes. They create a strong focal point in the yard by framing a location such as the patio, pool area or an otherwise unused corner of the yard that can be transformed into a cozy seating area with the addition of a gazebo shelter. Gazebos provide shelter from the sun and sometimes rain, especially when they are a hardtop model. The addition of a gazebo above your seating area will completely change your outdoor experience, by providing a shaded oasis to which you can escape for the afternoon. On a hot summer day, why should you give up the sun? With a gazebo, you can take your favourite book, a glass of lemonade (and some gin) to the backyard and relax in the shade. Enjoy the warmth without the discomfort of beating sun. Hardtop gazebos provide additional shelter from rain and elements. You can relax alone or entertain friends and family under a gazebo. There is a lot of debate over soft versus hard top gazebos. It depends on your particular needs, as well as financial situation. Soft tops are less costly, but require more maintenance as they typically must be dismantled before winter. They’re not as waterproof or able to withstand the elements as other types of gazebos. The soft tops cannot be left outside all year round. 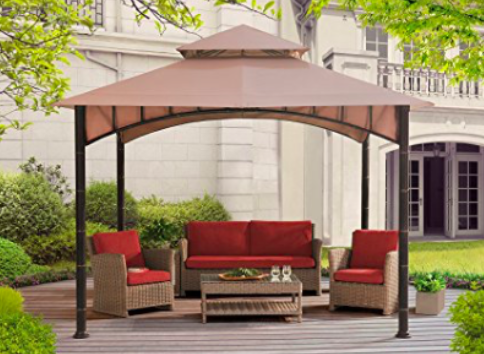 Soft top gazebos are easier to assemble and set up without the help of everyone you know. Hardtops cost much more, but are permanent structures that require little maintenance. Hard top on the other hand are waterproof giving you more options and time to enjoy the gazebo. These gazebos will never wobble or fall in a strong wind storm. 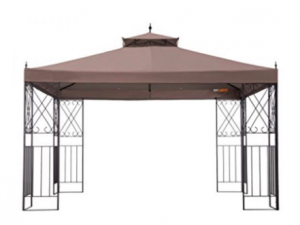 If you are thinking of adding a gazebo, but are not sure which type to get, we have compiled a list of the top five hard and soft top gazebos by Sunjoy to narrow down the search for you. This gazebo hardtop measures 12’ x 12’, a sizeable footprint standing 120” tall for plenty headroom. 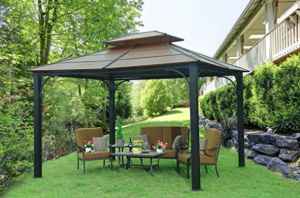 Combining magnificent design with shaded protection, this gazebo provides shaded oasis right in your own backyard. You can experience upscale living by extending your living space to the yard. The Royal Square is so roomy for optimal comfort. It has an added hook in the centre of the canopy, so you can hang a plant or lighting for extra ambience. The black hard top compliments the elegant pillars for an upscale appearance, giving style and functionality. It features sturdy steel and aluminum construction with a durable, rust-resistant powder-coated finish. The canopy is vented to allow for wind escape, giving the overall structure better stability. This one comes with a 12-month limited warranty. 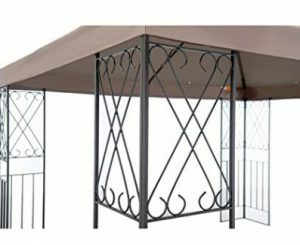 The Parlay gazebo is built from durable steel and makes for an elegant addition to any outdoor setting. its four posts are decorate metal panels giving the look of wrought iron and allowing for aerodynamic wind flow. The scrolls give classic beauty. The open bar design allows for many decorating options including twinkle lights or climbing roses. The metal is a smoke grey, dark and matte, while the canopy is tan brown. These earth tones will go nicely with existing décor and landscaping. The valence is tan and brown with an opening at its very peak giving wind an escape route. There are openings along the edges to allow for water drainage and are reinforced by grommets. You can also purchase mosquito netting and wrap it around the posts. This gazebo is a soft top and if you want it to be waterproof you will have to utlitise waterproofing spray. This gazebo takes a couple of hours to assemble. 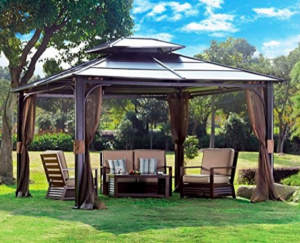 This hardtop gazebo will shelter you from sun and rain alike, extending your living space to the backyard and allowing to take advantage no matter the weather. It’s an all season gazebo that can be left outside throughout the year. This measures 10×12, the size of an average bedroom, big enough for furniture and seating at least six people. The design is clean with sharp lines and a copper top for a bit of pizzazz. 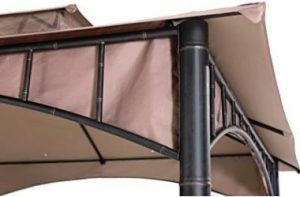 There is a stylish valance just under the gazebo giving elegance to the gazebo. There is also a built-in dual rod hanging system, from which you can hang mosquito netting or privacy curtains. 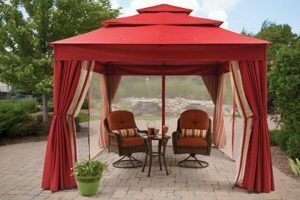 This soft top gazebo adds style and functionality to your outdoor living space, and will take just two hours to assemble. It is stable with well-tooled pieces that fit together to form a sturdy unit that provide protection from the harmful elements. Standing 10×10’ wide, you can enjoy a shaded area for entertaining or relaxing. The frame is composed of rust-resistant, powder-coated steel and aluminum. It is designed for long term use, with a vented soft top canopy. This model comes in a black frame with square posts, and a cloth roof that can stay open or be closed according to your preference. Together these design elements make a bold focal point for your backyard entertaining area. The posts can be secured with stakes or anchored to a wooden deck. 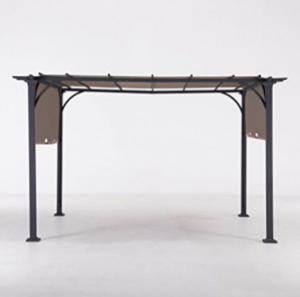 The versatile design helps this canopy stand apart from the rest. 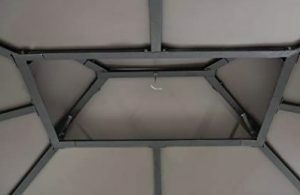 This gives you different design options, as you can close the canopy to block the sun, and open it to enjoy the stars at night. It measures 8×10 feet, a great size for covering a dining area or some lounge chairs. This pergola sells for around $560. 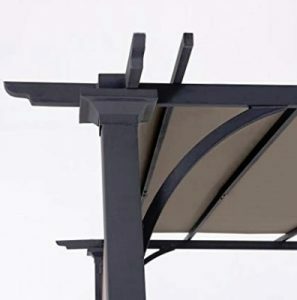 This gazebo measures 10×12 and comes with L brackets on each corner for easy fastening. It includes mosquito netting, which is zippered for ease of access. Two or three people can assemble this over the course of a weekend. 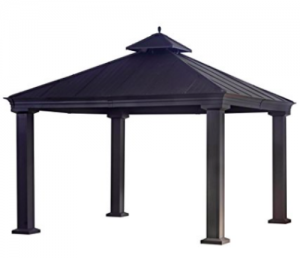 From start to finish, this is a quality gazebo with intuitive assembly. 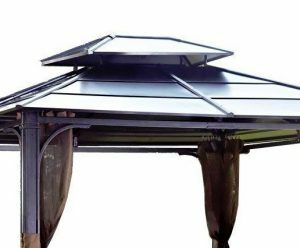 Its roof is vented to allow for wind escape, and the posts can be anchored to any kind of base whether it is a wooden deck, concrete patio or earth ground. 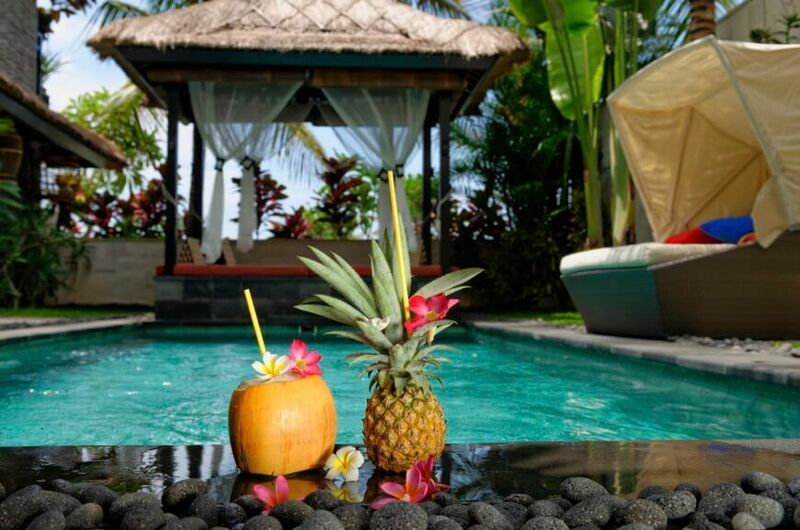 Sunjoy is a trusted name in the outdoor furniture market. They care about providing quality products to their customers. Everything is made with attention to detail. Whether it’s small details like the stitching, or overall design innovations, Sunjoy is a company that we would recommend to those who want to enjoy their backyard more fully. The company has structures that can be trusted. They won’t break or collapse under nature’s unpredictable onslaught. 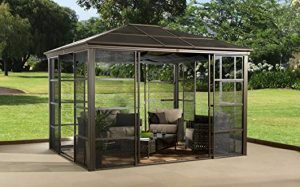 Sunjoy gazebos are a wonderful addition for your next backyard event or a time you want to be alone and feel like you’re on vacation.